Filed to: mother!Filed to: mother! 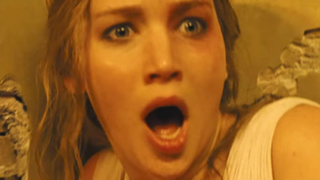 After opening yesterday to only $3.1 million, mother! has gotten an “F” rating on CinemaScore, both an indication of a terrible opening and a kind of badge of honor. “It’s very hard to get an F,” a studio executive told me. “Audiences are usually more forgiving than critics.” It’s hard enough to get an “F” that the score alone has been making headlines all day. On the upside, the score puts it in good company with films like Solaris and Killing Them Softly, which did relatively well with critics and poorly with audiences. “If anything, a Cinemascore F means that a movie is challenging, confusing, even uncomfortable,” writes Vanity Fair, “but by no means does it indicate that it’s bad.” The critics are giving it mixed reviews. Salon: hit. The New Yorker: miss. The New York Times: on the fence. Critics seem to universally agree that it’s irritating, whether that’s a sign of artistic mastery or pretentiousness. At the New York premiere on Wednesday night, director Darren Aronofsky stood alongside three other male movie producers and executives onstage explaining the significance of his interpretation of motherhood, telling us that we wouldn’t like it at first, but we’d come to appreciate its slow burn. And then he trotted out Jennifer Lawrence to praise her as a “once-in-a-generation talent” which “shines brighter than any projector” (they’re dating). Maybe I want my directors humble and insecure. Maybe the boys’ club back-patting made me skeptical of a movie about motherhood as a topic for a Paramount production directed by a male genius. Aronofsky’s shadow is cast over the whole movie; it’s technically a good film in the way that we all know that a high school class on the use of metaphor and foreshadowing in the Great Gatsby is instructive and important. The female lead (Jennifer Lawrence, who plays the role of caretaker and permanent host) has no interior life, but everything’s intentional, so she’s a symbolic empty vessel. (SPOILER ALERT) Did anybody notice that the movie starts and ends with the word “baby”? Or pick up on the recurring use of blood? Or the Paradise, Hell, and Mother Earth themes? The art references? If you can think of a synonym for motherhood, it’s in there. And all of this plugs into Aronofsky’s narrative formula: a horror/drama version of sketch comedy where you know that things are going to slowly escalate to the farthest logical extent, just not exactly how, but twenty minutes in you can guess. Go? Yes. It’s brutal, and it’s not a good movie to see on a date (or in the theaters or alone or at home or with friends or anywhere). But It got a B+ on CinemaScore and made $123 million last weekend, and this one at least is giving everybody something to talk about. Jennifer Lawrence Tore Her Diaphragm While Filming Darren Aronofsky&apos;s mother!